Subaru has launched the XV Concept, a crossover SUV designed to have a ‘playful nature’ according to the brand. The XV combines stylish design with the functionality and practicality associated with crossovers. It’s powered by a 2.0-litre boxer engine via a CVT automatic gearbox. 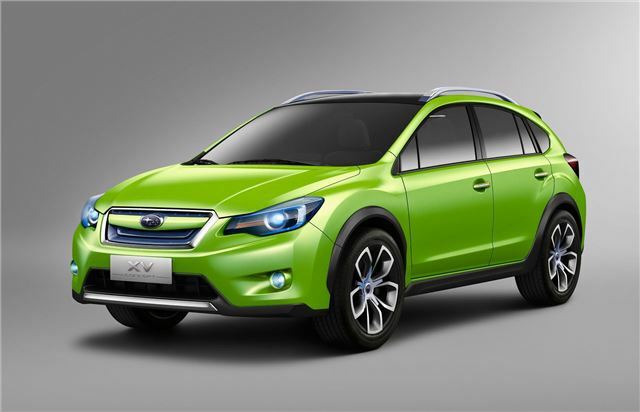 Externally the XV is bold, with a signature hexagonal grille and hawk-eye headlights. The hexagon motif continues at the rear. Rear lights are layered, with a distinct line flowing between them to give the car a wide stance. The roof is made entirely from glass. Silver spoked, black rimmed 19 inch alloy wheels and bright green paintwork finish the design. Internally there are white leather seats with green piping in selected areas, contrasted against dark materials used elsewhere. There is a large multi-function panel in the centre console with controls for navigation and audio systems and a displays with vehicle information. And LCD monitor in the dashboard supports EyeSight cameras, allowing the driver to look at images captured from external cameras.